#Breckenridge #FamilyFun – The Lighting of Breckenridge & The Running of the Santas! The holiday magic in Breckenridge begins TODAY with the running of the Santas and the lighting of the Christmas tree in the center of the town square. The event today is a great deal of fun, but it also is a fundraiser for the Adopt an Angel Summit County, which helps families who would not otherwise be able to provide gifts for their kids during the holidays. 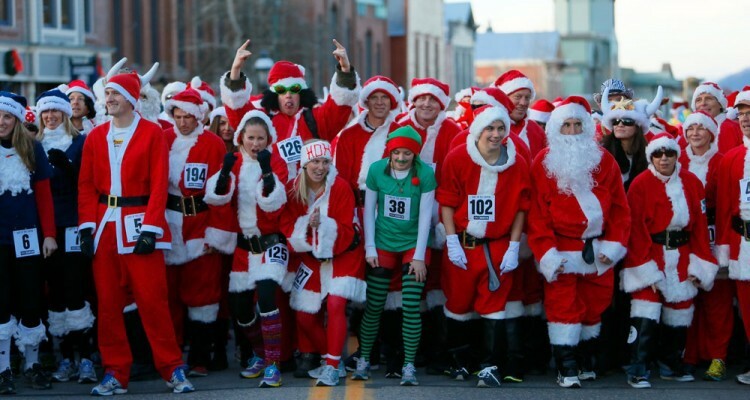 Everyone is Santa or Mrs. Santa, unless you are under 12, in which case the appropriate dress code is antlers and jingle bells, and the run is motivated by Santa’s favorite treat – cookies and milk. And afterwards, the real Santa leads the townsfolk down Main Street to the lighting of Breckenridge, complete with carolers and cocoa, against the backdrop of glistening snow on the quaint Victorian town and the towering Rocky Mountains. This entry was posted on December 6, 2014 by elevatemarketingaz. It was filed under Breckenridge Colorado Luxury Condo Sales, Fractional Ownership Real Estate Breckenridge CO, Fractional Ownership Real Estate Summit County Colorado, Fractional Real Estate Breckenridge, Fractional Real Estate Breckenridge Colorado, Luxury Fractional Real Estate Breckenridge CO, Luxury Fractional Real Estate Breckenridge Colorado, Luxury Fractional Real Estate Summit County, Colorado, Ski In, Ski Out Luxury Condo Summit County, Co, Ski In, Ski Out Luxury Condo Summit County, Colorado, Summit County Colorado Luxury Condo Sales, Summit County Real Estate and was tagged with Breckenridge Colorado accomodations, Breckenridge Colorado condos, Breckenridge Colorado skiing, Breckenridge luxury condo sales, Brent Henry Breckenridge real estate broker, Grand Colorado on Peak Eight, ski_in_ski_out Breckenridge condo, Summit County Real Estate.